"Culmination of years of complaints, objections and futile efforts"
Ramblers protesting yesterday against the lack of public access to the bay at Fomm ir-Riħ. 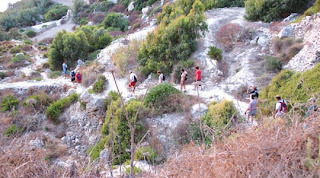 Photo: Malta Ramblers Association. The Ramblers Association yesterday walked at Fomm ir-Riħ in protest at the lack of access to a public beach and the ecological ravage caused by what it said were unauthorised buildings and illicit plantation of invasive trees and plants. Association president Lino Bugeja said that a report on the area by the Malta Environment and Planning Authority (Mepa) "unashamedly makes no mention of the pitiful state of the natural environment, totally ignoring the rapid deterioration of the countryside and coastal zones throughout the Maltese islands". Did this mean that areas of high landscape value, ecological importance and accessibility to coastal zones were no longer Mepa's responsibility? he asked. He pointed out that the parliamentary secretary responsible for lands, Jason Azzopardi, had requested an urgent meeting on the matter, with which he is not yet fully conversant, and sent a team from his department to prepare a preliminary survey of the Fomm ir-Riħ which is to form the basis for discussion. In a protest letter, being sent to the director general of the Government Property Division and copied to Prime Minister Lawrence Gonzi, Labour Party leader Joseph Muscat and to Dr Azzopardi, the association said that their protest was "the culmination of years of complaints, objections and futile efforts" over the situation at Fomm ir-Riħ Bay. "While sympathy and lip-service were forthcoming from various ministers and authorities... proceedings on the ground, where it really mattered worsened, with the situation deteriorating to unprecedented illegality." Immediately take in hand the re-establishment of the path from the Baħrija side. This public path to the foreshore of the bay was conceded by public deed in 1983 but never maintained. Restore the old road on the Ras il-Pellegrin side that rightfully belong to the people from time immemorial and that was unilaterally blocked in 1969 despite public protests ever since. Put an effective stop to the ecological ravage through unauthorised development and illicit plantation of invasive trees and non-indigenous plants illegally taking place on location, a Natura 2000 site, harming the local ecosystem.